Tubby's Party & Event Rentals provides bounce house, Party and Event rental services throughout the greater Calgary, Alberta and surrounding communities area. 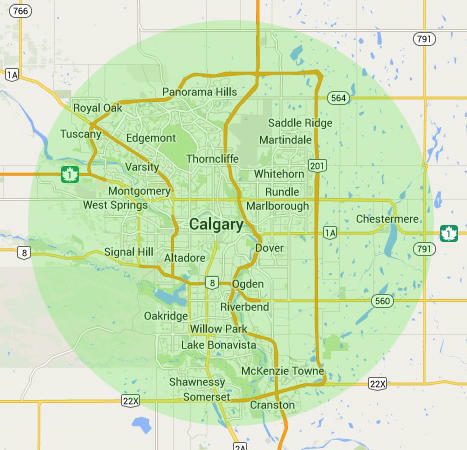 We also service surrounding towns and cities like Okotoks, Airdrie, and Cochrane. In addition Tubby's Party & Event Rentals will provide event service to other Alberta cities and communities,Banff, Canmore, Red Deer, Edmonton, Medicine Hat,Lake Lousie, Lethbridge,Drumheller, Fort McMurray. As well as providing service to neighboring provinces, British Columbia, Saskatchewan and Manitoba. If you don't specific see your community listed here, please call us at (403) 284-3622. This is not a comprehensive list and is intended only as a general geographic list, and we will be happy to discuss deliveries to your specific location. This is our general Delivery area that we delivery to, without addition charges when order minimums have been meet. Always best to check with the office in case you have any questions.